NOSORH Data Institute Begins This Month: Register Now! There is still time to register for the Fall 2018 NOSORH Rural Health Data Institute. 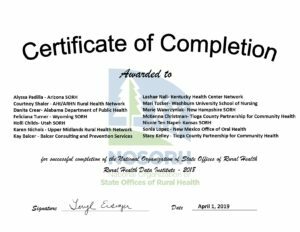 The Rural Health Data Institute (RHDI) is a set of eight 90-minute web-based sessions designed to establish a minimum data-use skill set for those working with rural health data. The sessions are designed for those with little or no knowledge of the data use process. RHDI starts by throwing the term “research” out the window and defining terms in a way that everybody can understand. It moves through the process of collecting your data, cleaning it up, and analyzing it in a way that makes sense. Later sessions help participants work through the steps of crafting their messaging and displaying it in a visualized way so other people can understand it too. By doing very small “homework” assignments aligned to the data use process, participants will end the RHDI with a one-page infographic fact sheet to do whatever they want with it: hang on the fridge in the break room or, better yet, disseminate it to your partners! More information on the RHDI can be found in the program brochure, here. Register today by going to: https://regonline.com/RDI2018. For more information on the Rural Health Data Institute, please contact Chris Salyers at chris.salyers@nosorh.org or (734) 881-9551. Rural Health Data Institute: Register by August 12! There is still time to register for the first Rural Health Data Institute starting on September 13, 2016! 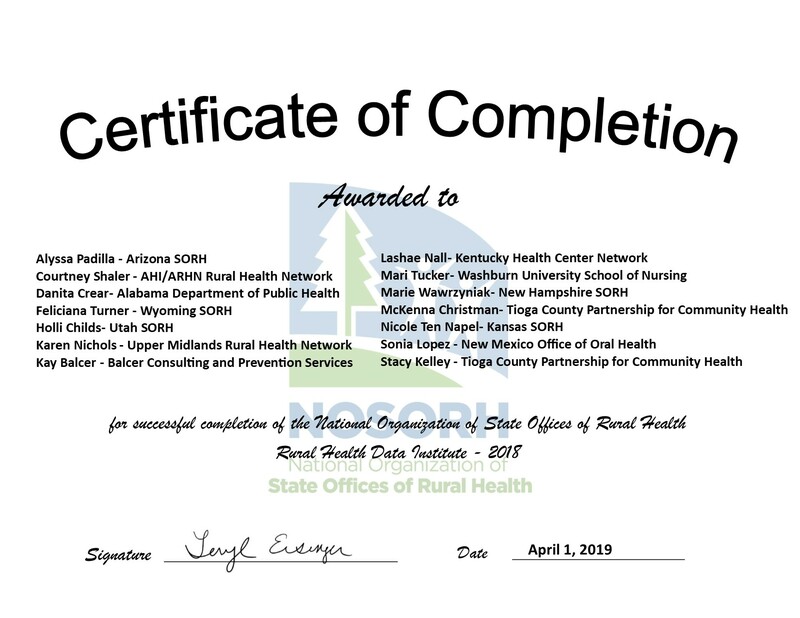 The Rural Health Data Institute is an online training opportunity designed to provide all SORH staff with a minimum data-use skill set. To accomplish this, the curriculum is designed over eight two-hour sessions meeting every other Tuesday through December 20 from 1:00 – 3:00 pm Eastern. The eight sessions are intended to assist novice data users in identifying a question, collecting and organizing data, analyzing and interpreting data sets, selecting appropriate messaging, and developing data visualizations. Throughout the course, participants will work through each step to develop a final visualization that is relevant to their office and can be used within their state. To kick off the Rural Health Data Institute, several SORHs will be presenting at the NOSORH Annual Meeting in Boston on September 7-8 to showcase the work being done in their states with data and data visualization. Those signed up to participate in the Rural Health Data Institute are strongly encouraged to attend this session to gain a better understanding of how data can be incorporated into their daily tasks. Registration for the Rural Health Data Institute is open to SORHs only, but the number of seats are limited. You can register for the Rural Health Data Institute here. The deadline to register is August 12. Rural Health Data Institute-Registration Now Open! NOSORH is proud to announce the launch of its first Rural Health Data Institute, which kicks off on September 13 and goes through December 20. The Rural Health Data Institute is an online training opportunity designed to provide all SORH staff with a minimum data-use skill set. To accomplish this, the curriculum is designed over eight two-hour sessions meeting every other Tuesday from 1:00 – 3:00 pm EST. The eight sessions are intended to assist novice data users in identifying a question, collecting and organizing data, analyzing and interpreting data sets, selecting appropriate messaging and developing data visualizations. Throughout the course, participants will work through each step to develop a final visualization that is relevant to their office and can be used within their state. Several SORHs will be presenting at the NOSORH Annual Meeting in Boston on September 7-8 to showcase the work being done in their states with data and data visualization. Institute participants are strongly encouraged to attend this session to gain a better understanding of how data can be incorporated into their daily tasks. This Institute would not be possible without the generous work of all those who participated in the planning committee. Penny Black (WI) spearheaded this endeavor along with the assistance of Joyce Hospodar (AZ), Angie Sechler (MN) and Lara Brooks (OK). The assistance of such experts, along with those who will be presenting sessions, will ensure an excellent NOSORH institute. Registration is now open to SORHs, but the number of seats is limited. Click here to register for the Rural Health Data Institute. The deadline to register is August 12. Rural Health Data Institute- Save-The-Date! The NOSORH Rural Health Data Institute starts September 13 and registration is just around the corner! This 8-session online institute will assist SORH staff in understanding, finding, analyzing, using, and visualizing data important to rural health issues. Registration space for the first cohort will be limited and only available to SORH staff. Look for more information in your inbox within the next few weeks!